Meatballs aren't usually associated with the grill, but they're becoming the meat form of choice for me when I want to do a ground meat creation that brings in influence from other cuisines and cultures. 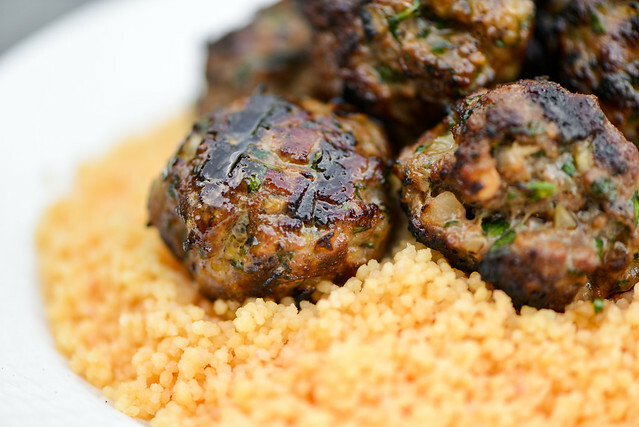 When done with the right consistency, meatballs actually cook incredibly well over a live fire and are so quick to make and versatile, they've served me well again and again in many variations, including: Greek, barbecue, Italian, and now, Moroccan. Continuing on the Moroccan road I'm treading this month, I was looking for short cut to bring me another North African dish without the amount of work I had to put in for merguez or the resulting sandwiches. That path led me to these chicken brochettes (otherwise known as skewers). 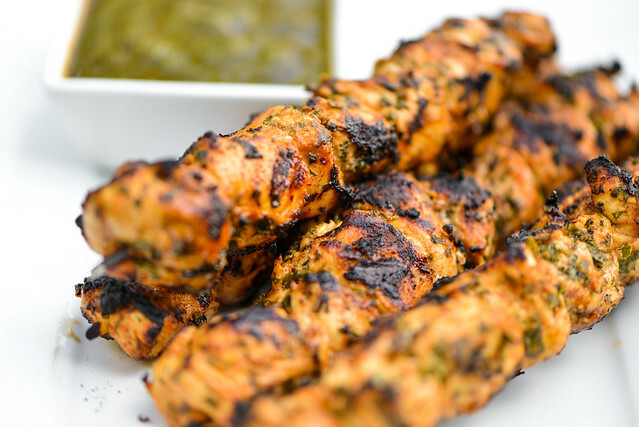 Just about every culture has their own variation of meat on a stick, and I can attest that these little cubes of marinated chicken just went to further prove why that tradition is one that will never die. I was pretty damn proud of myself that I pulled off making merguez at home. 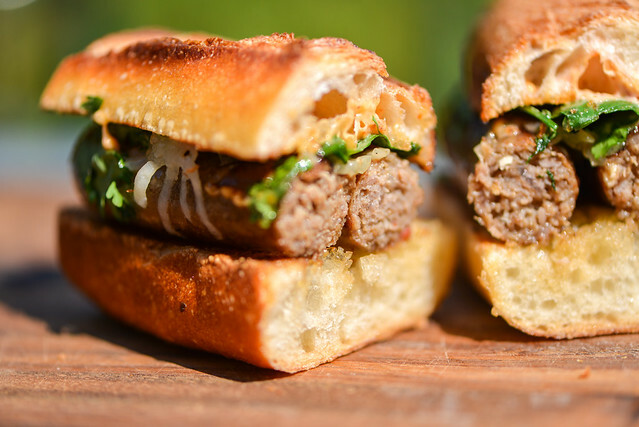 I thought I hit a high point in my exploration into Moroccan-influenced grilling with those links, but then I took those little sausages and put them between a toasted baguette, added some caramelized onions, cilantro, Manchego, and harissa mayo and created one of my favorite things I've ever grilled. There can't be a bad Meatwave—as long as I'm with my friend and grilling, I'm happy—but some certainly stand out as true achievements. One of those was last summer's Meatroccan Nights, where I decided to do an entirely Moroccan-themed menu that spanned eight different recipes. I tend to overdue the amount of recipes I tackle each time I have an audience, but that's part of the game, especially considering they won't all be winners. On that day last June though, each thing I pulled off the grill just seemed better than the last, and by the end of the day I remember feeling very accomplished and proud of what had just transpired. 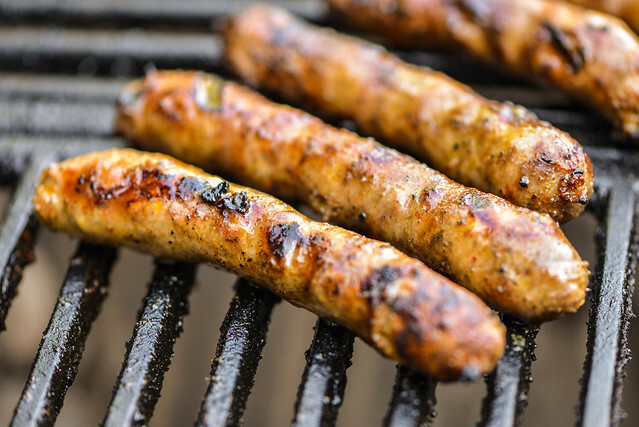 So to relive one of my prouder grilling moments, I'm dedicating the entire month of July to the Moroccan-influenced recipes from that day, beginning with the one that sparked the idea in the first place—merguez.